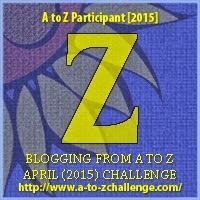 The final day of the A to Z Challenge! It seemed fitting given that my theme was Addicted to Beads to finish on the one set of beads that I am known for being very addicted to... Zodiac Birthstone Stars from Trollbeads! These are a set of 9 silver beads with a gemstone set at the centre of the bead to represent a birth sign, some of the stones are doubled up hence you have a set of 9 not 12. As you can see I have at least 2 of each and more of some of the zodiac stars. These were retired (no longer made) when I started collecting and it's taken me quite a while to get the first set, let alone the second or the multiples!! I really love this set of beads. Congratulations to those taking part and huge thank yous (above) to all the lovely people who have popped by Curling Stones for Lego People on the way to read, leave comments and generally just cheer us all on! What has been your favourite bit of the A to Z? Those are beautiful, well done in having the patience to collect so many. Thank you also for all the wonderful posts - I knew nothing about bead collecting until I read them. I think my favourite bit of the AtoZ has been learning so many interesting things - there have been so many fantastic blogs to visit this year. Thanks Natasha, it's been lovely this year I agree - I'm definitly down on the amount of blog hopping I'd hoped to do this month but the list is up all year so may well be taking a slow meander later on when I have a bit more time! I'll definitely be doing the Reflections Post this year on the linky list I think as did the post but missed the link last year! Thanks for sharing your knowledge of beads--I had no idea there were so many different kinds! You're very welcome Melanie, I had a great time this year, I really enjoyed the theme part! Thanks for your stories too, it's been a lovely A to Z month! Thanks to you too, been great popping over to your blog! Been so nice getting to know everyone this year! I love all your wonderful pics Mars and great bead info! I especially liked the post when you talked about the glass bead cores in such detail as I really never saw this discussed on any other blogs. I'd love to see some of the glass beads you made sometime, even if they are a bit wonky I bet they are still great! I will show some of my beads at some point, I've got a post scheduled for the end of next week (I think) where I show our taster session which was back in February, they're still on the mandrel shots... ironically in about 2 hours I'm expecting my friend who I went beadmaking with as I haven't seen him since (we don't live nearby) so we can finally sort out which beads belong to whom, not that I think either of us can remember as we were working with the same few colours provided... but it does mean I get to show him my cores lolz! Next step is I've bought my bead bible, I'm self teaching which is always a long journey, so I'm going to do some book learning, already I've realised I've aced the chapter on when things can go wrong with your beads ;) But seriously, I'm really enjoying the adventure! Yeah, I have many glass with 2 piece cores and they don't bother me, nothing a little bead glue won't fix if they get loose! Great, can't wait to see the beads you made! Wow, what a great collection of stars! Congratulation to those beauties! And I want to say thank you for showing us your nice pics and stories behind them! Thanks Do, another set of my favourites! I wondered if you'd considered a translate widget for your blog? I notice you also use Blogger too, mine is just a standard blogger one (top right if you're viewing the web version (doesn't work if viewing from a mobile and not on web view). Asking as I'd love to read your words but sadly have none of German! Excellent! Thank you :D It's always lovely to look at pics but I much prefer to be able to read the words too! And in the shape of the letter A. Well done! Thanks for all your posts and hoping to see you return for 2016 A to Z! Thanks Stephen, it's been a good challenge this year hasn't it? Enjoyed the blog hopping too!